I just tested the Duskblade and it seems to work if you attack within a certain timeframe after storing the spell. I don't quite understand where that duration is derived from, though. it might be in the x2_inc_spellhook.nss include (which makes it a pain since you might have to recompile a bunch of scripts if you want to change it). EDIT: Also try activating DEBUG mode (PRC OPTIONS in your special abilities radial -> alter code switches -> PRC_DEBUG) and look at what it says when you put a spell on your weapon and try to attack with it. EDIT2: the 13+ lvl version of this works sort of. It slightly bugs out by stopping the automatic new target acquisition when you kill with the on-hit spell and it just has a counter how many times it can be triggered(i.e. extra attacks above 5 per round will not trigger it despite the description saying it will hit each target hit in that round), it also triggers each time you hit the same target. As for prismatic sphere, it's one of those spells that were really sloppily implemented. It would probably take a greater effort to make a proper version that actually works somewhat like the pnp version. I made the "banishing" effect temporary for a high power module I was playing previously but I am not sure to what degree the spell should be changed to be "balanced". I see, I see, you're right, it was my misunderstanding, and my understanding of it was colored due to a strange quirk of Arcane Channeling and other on-hit spells (explained further on in post). For a moment there I thought I misunderstood the idea behind a duskblade, but the touch attack always hits. Boy, though, that 60 second window sure is rough. At least automatic quicken spell is a thing. The next image shows results of me actually paying attention. I can't really copy-paste the logs, but it looks like no matter where they are, anyone in the sphere is exposed to all of the effects. Image clearly shows sphere working correctly. Everyone survived -- why's it always work when you don't want it to? I haven't been able to capture any moments where this happens, but I swear I've killed things I've had no business killing that should have made their fort saves every time. I will try and add to this testing when I come across more spellcasters. 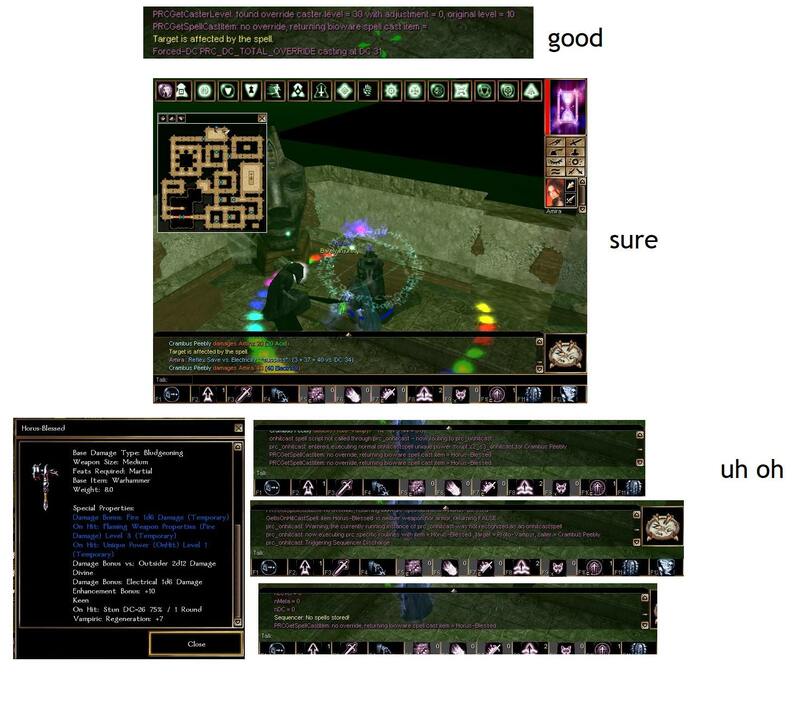 The bottom four images showcase part of my initial problem with Arcane Channeling. It seems the duskblade spells don't work correctly if there are already other on-hit spells on the weapon (flaming weapon... I also put blade of fire on it to see if that was an on-hit, it is not). The final problem, which is why I was actually confused in the first place, is the same as above, but it only output the very enigmatic "prc_onuserdef: 1006" which arises when using Enserric as my duskblade channeling weapon. I surmise this is because Enserric's talking script is an on-hit spell (it says on-hit intelligent weapon level 1). So duskblade spells don't play nice with even permanent on-hit spells. It is confusing because it seems somehow other module builders have successfully added weapons with multiple on-hit spells that are cast, though they are permanent enhancements. This is compounded by the fact that when using Enserric, it does not say "no spells stored" or what have you, it just doesn't discharge. I was a fool not to notice that Enserric's script might have interfered. Thank you so much, I will continue testing this. I definitely appreciate you showing me the PRC_DEBUG mode, because it proves that while there's a secondary melee touch attack being made, it always automatically hits. Now I can just hope that I find a good use for it since I know what types of spells to avoid... Unfortunate that I don't get to use Flaming Weapon at the same time! Also, even though Prismatic Sphere works, I guess I ought to stay away from it when not testing it. Even Tony K's legendarily (dastardly) good AI does not avoid or dispel harmful AoEs, as far as I have observed. From the most backwoods goblin shaman to a mighty undead priest of a profane god, every enemy apparently just wants to walk up to you and touch you no matter what. It's strange that Deekin's AI in HoTU was programmed to dispel AoEs, I have to assume it's not as simple as a copy-paste for other npcs. I fought the final boss(es) of this module, who were probably 5-10 HD above my level, and they succeeded all of their checks in the sphere multiple times to no ill effect. I have no idea what happened before, but it looks like everything is functioning properly. Time for the next useless thread. In my experience, it's usually spell resistance that helps the most against the prismatic sphere. Glad I could be of help even if it's not quite a perfect solution. Not sure it's an ideal solution, but as a quick fix updated Duskblade to allow 10 attacks in a round and the spell to be stored for 5 minutes. As for the rest, unfortunately, there's a lot of things that can stop the spellhook/onhitcast, and it seems something further up the line is eating it before the spellhook even gets there.